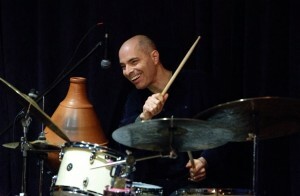 The Sirkis/Bialas International Quartet is a collaboration between Israeli UK-resident drummer/composer Asaf Sirkis and Polish vocalist/composer Sylwia Bialas. The quartet also features London-based, Scottish bassist Kevin Glasgow, and the acclaimed Frank Harrison on piano and keyboards. With an emphasis on band interaction and sheer joy of playing, this band celebrates music from both collaborators, covering a wide range of influences such as contemporary classical music, Polish folk, South Indian and Middle Eastern musics as well as a wide range of dynamics – from the most delicate ballad all the way to high-energy electric virtuoso lines and everything in between. Expect soulful melodies, atmospheric sounds with strong grooves, a full colour electro-acoustic jazz with an ethnic touch and some uncommonly used instruments and sound effects. The quartet was received by a packed house with rapturous applause when they played at the Globe in October 2016. This is likely to be a very popular gig. This concert is jointly promoted by Jazz.Coop and Jazz North East.